Any guesses, based solely on the faces in the photograph, on who was the victor on the night depicted here, and who the vanquished? 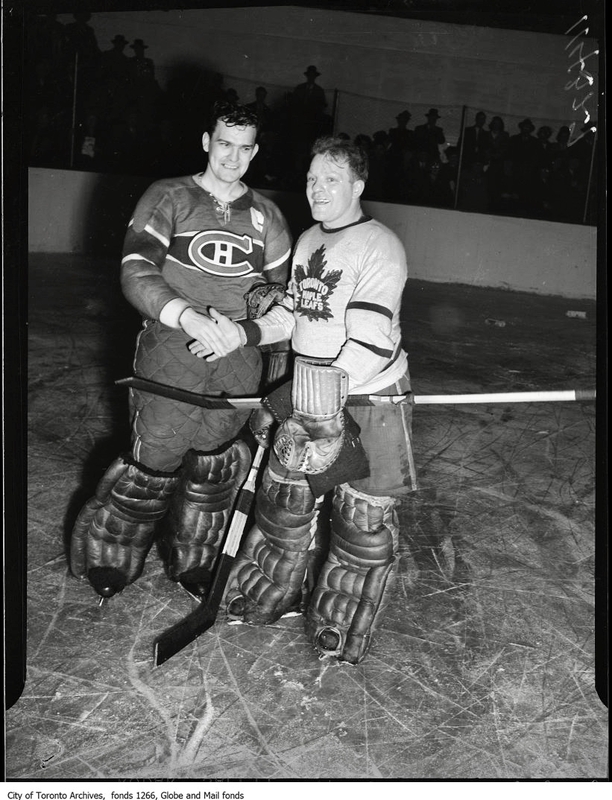 If there’s something you’re seeing in Bill Durnan’s smile on the left that suggests that he prevailed at Maple Leaf Gardens on Saturday, April 19, 1947, well, then, um, sorry, you’re mistaken. The triumphant grin is, in fact, Turk Broda’s on the right. And why not? With their 2-1 win over Montreal, he and his Toronto Maple had just won the Stanley Cup in six games. 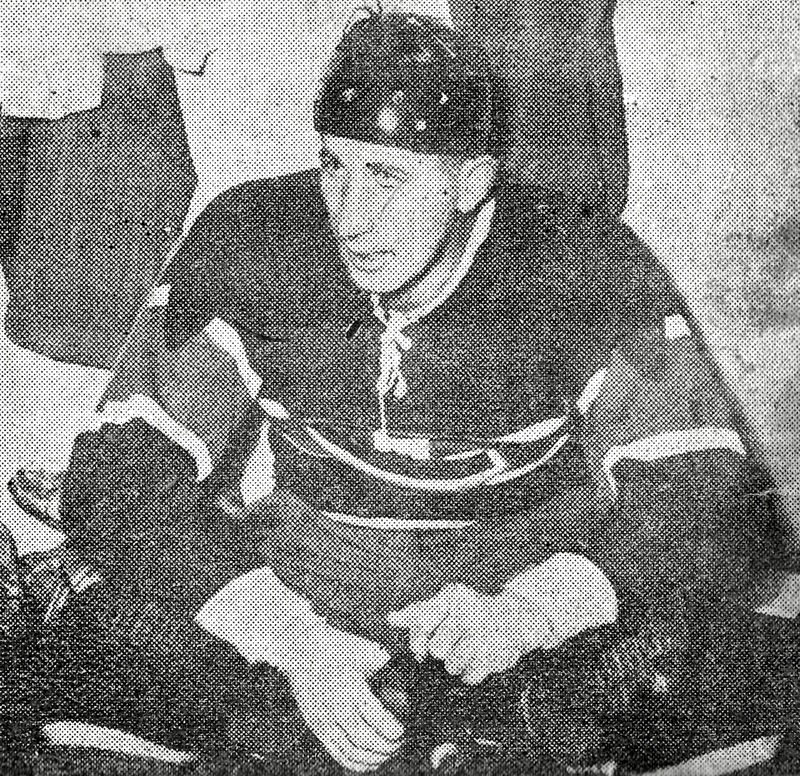 Durnan did win two Stanley Cups with Montreal, in 1944 and ’46. He also won the Vézina Trophy, as the NHL’s top goaltender, in six of his seven seasons in the league. Born in Toronto on a Saturday of this date in 1916, Durnan died at the age of 56 in October of 1972 — just a week, as it so happened, after Turk Broda’s death at 58. Top Gear: Elmer Lach, on the right, fits linemate Maurice Richard with the helmet he wore for all of two games in 1947. Lach’s, just visible at the bottom of the frame, didn’t have quite so long a career on NHL ice. 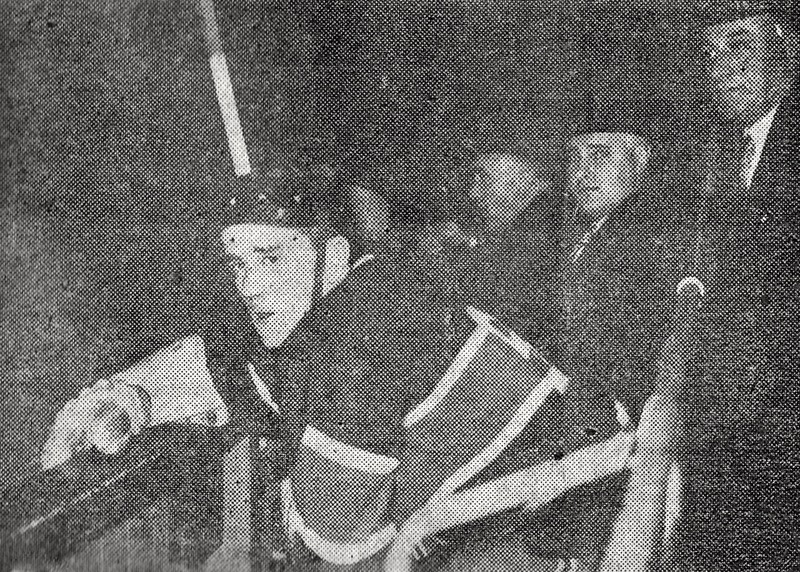 Helmets for hockey players weren’t exactly new in 1947, but in the NHL they weren’t exactly a common sight — unless you were looking at defenceman Jack Crawford of the Boston Bruins, the lone man among the league’s 120-odd skaters to regularly don headgear in the post-war era. So what prompted two of the game’s best players to (very briefly) try a helmet in the early going of the 1947-48 season? Short answer: don’t know for sure. 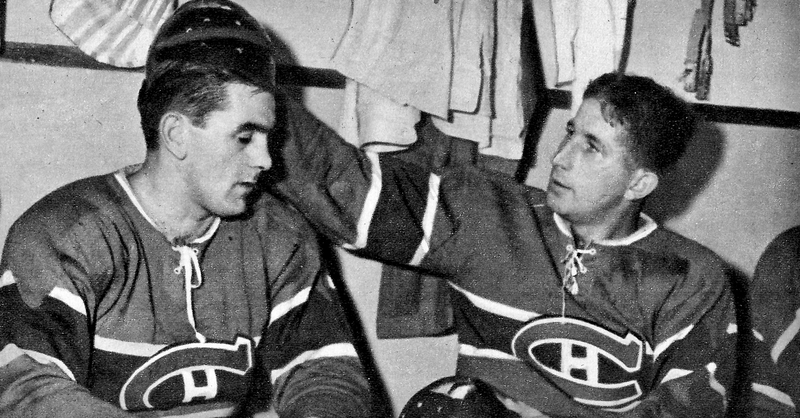 It could have been that, well into their high-impact NHL careers, linemates Maurice Richard and Elmer Lach of the Montreal Canadiens reached a point where it seemed worthwhile to try to mitigate the risk of (further) head injury. Or maybe were they helping out a friend with a new product to promote? Either way, the experiment didn’t last long, raising a few eyebrows while it lasted, some mocking jeers for the cheap seats. Were the helmets too heavy, too hot, too attention-getting to last? That’s something else that’s not entirely clear: just why Richard and Lach decided to ditch their helmets after just two games. 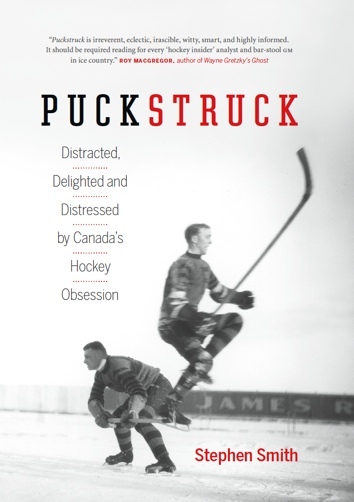 Both players, in 1947, knew well what could happen to your hockey-playing head out on the ice. Lach was also, famously and unfortunately, prone to injury. 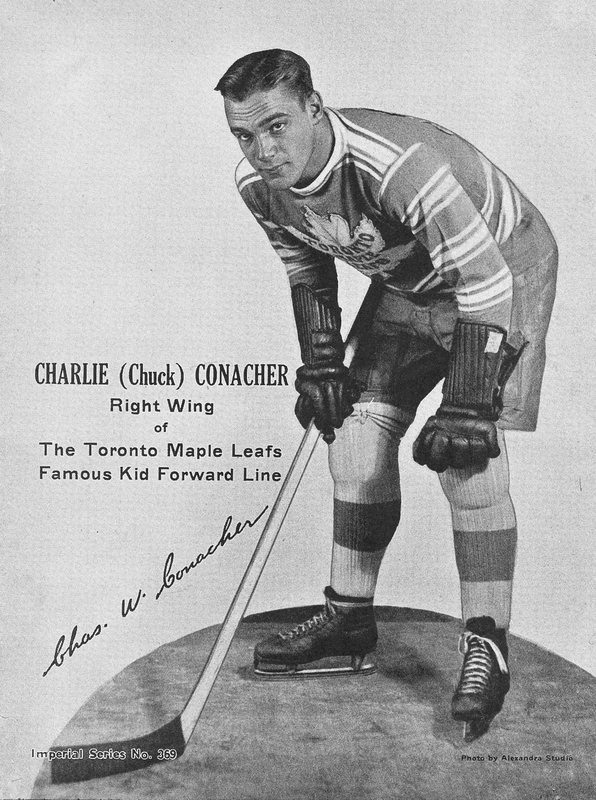 The headline in 1950 when Trent Frayne came to chronicle this painful propensity for The Saturday Evening Post: “You Can’t Kill A Hockey Player.” Lach’s skill and spirit was beyond doubt, Frayne wrote; “this all-out performer” also happened to be the man who’d been “injured severely more often than anyone in this violent game.” In his second year in the NHL, he’d missed all but Montreal’s opening game after a fall into the boards broke his wrist, dislocated a shoulder, and shattered his elbow. He was subsequently sidelined by a fractured cheekbone and (both in the same season) one broken jaw after another. Lach didn’t play again that season. Without him, Montreal still made their way to the Stanley Cup finals, where they fell in six games to the Maple Leafs. Richard’s performance that April might have itself been a further argument in favour of protecting the heads of hockey players, except that it wasn’t, really, at the time — the lesson didn’t seem to take. 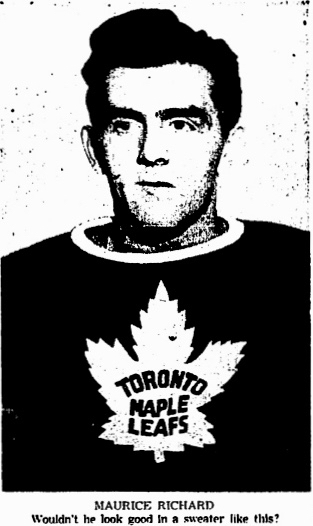 In the second game of the series, Montreal’s 26-year-old Rocket twice swung his stick at and connected with bare Leaf heads, cutting and knocking out winger Vic Lynn and then later going after Bill Ezinicki, who seems to have stayed conscious if not unbloodied. Both Lynn and Ezinicki returned to the fray that night; Richard got a match penalty and a one-game suspension for his trouble. 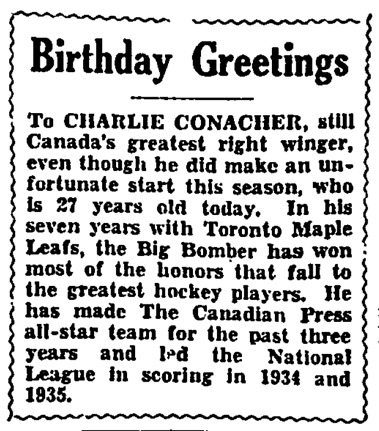 “Elmer Lach looking in the pink and shooting in the low 70s on the golf course,” Montreal’s Gazette was reporting in August of ’47. “No more ill effects from that fractured skull.” He had a strong training camp that fall back between Richard and left-winger Toe Blake. 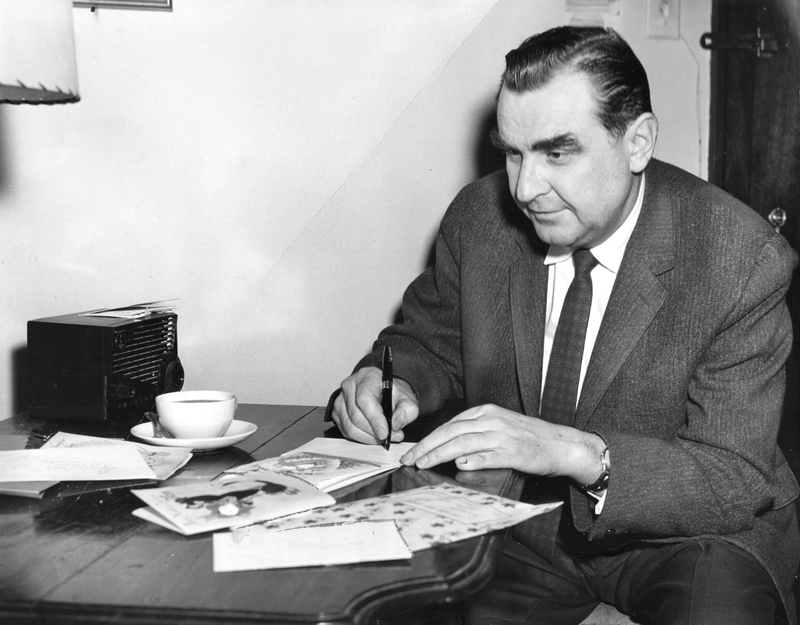 In mid-October, with Montreal about to launch a new campaign at home against the New York Rangers, Richard waited until an hour before the puck dropped to sign his contract for the season. 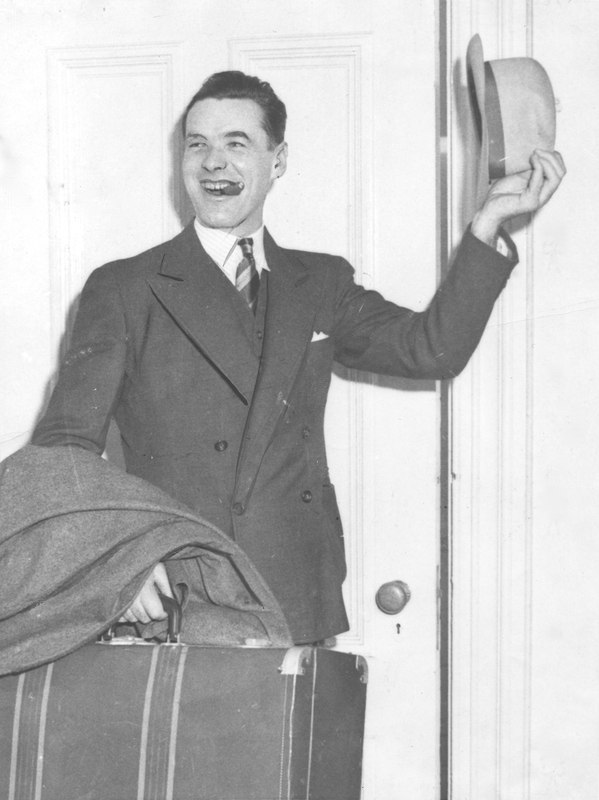 But once that was done, it was back to business as usual for Canadiens’ famous Punch Line. Nokomis’ Own Dandy: Lach in his helmet on the day of its debut, November 27, 1947. Fans recalling Lach’s injury would be comforted by the sight of his helmet, Carroll thought. In his Gazettecolumn that week, he wondered why more players didn’t favour similar protection. A decade earlier, he noted, a whole parcel of players had worn helmets, including Eddie Shore, Flash Hollett, Earl Seibert, and Babe Siebert — though of course all but Shore had eventually shed theirs, playing on without. Boxed: Maurice Richard sits out his third-period elbowing penalty during the November 27 game at the Forum. But even then, the trial was almost over. The night Lach and Richard debuted the helmets at the Forum, Montreal beat the Leafs by a score of 2-0. Two nights later, when the teams met again at Toronto’s Maple Leaf Gardens, the home team prevailed, 3-1. None of the game summaries I’ve read mention that maybe the Leafs’ Gus Mortson would have benefitted from a helmet of his own. Reacting to a bodycheck, Kenny Reardon swung his stick and cut Mortson’s head, earning himself a five-minute major. Mortson? “Continued to play, turned in a good game,” the Globe’s Nickleson wrote. 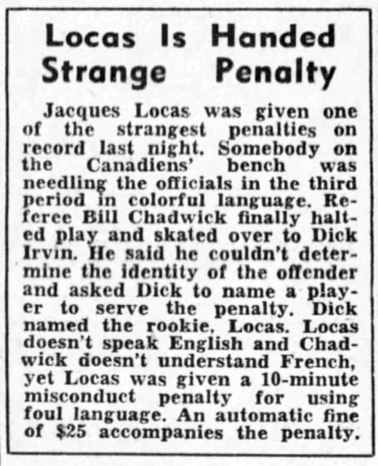 For Montreal’s next game, in Detroit, Lach and Richard returned to regular bare-headed order. With that, the debate for and against helmets in the NHL went into hibernation for another couple of decades. The anniversary of its awakening is this week, in fact: Tuesday it will have been 51 years since Bill Masterton of the Minnesota North Stars died at the age of 29 after a hit that knocked him and his unhelmeted head to the ice. Tusslers: Richard and Toronto defenceman Gus Mortson … hard to say what they’re up to, actually. A bit of vying, I guess; some grappling? 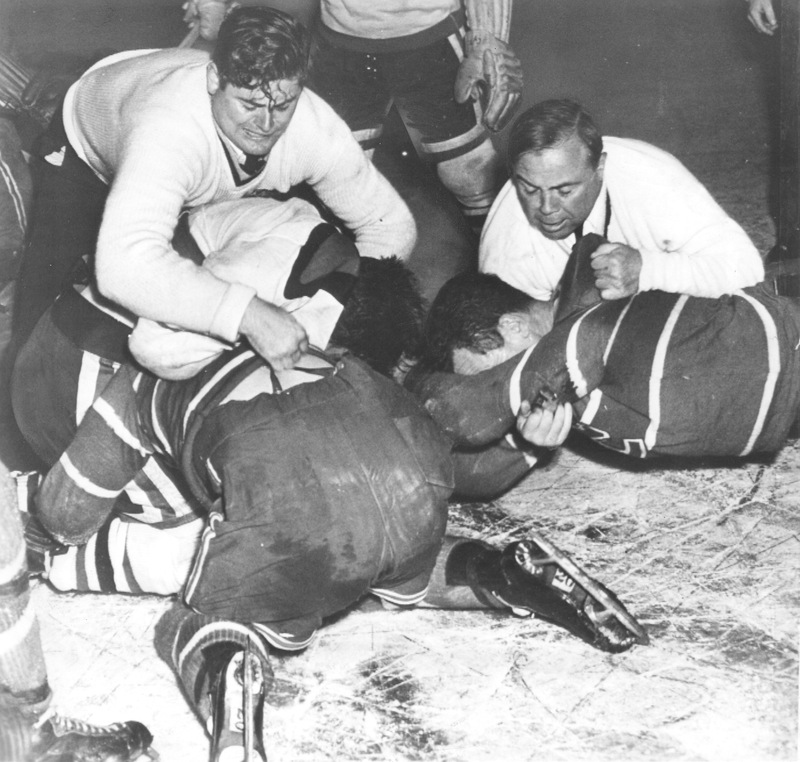 In The Throes Pose: On the night of November 2, 1947, Montreal’s 4-2 win in Chicago ended in this mess. 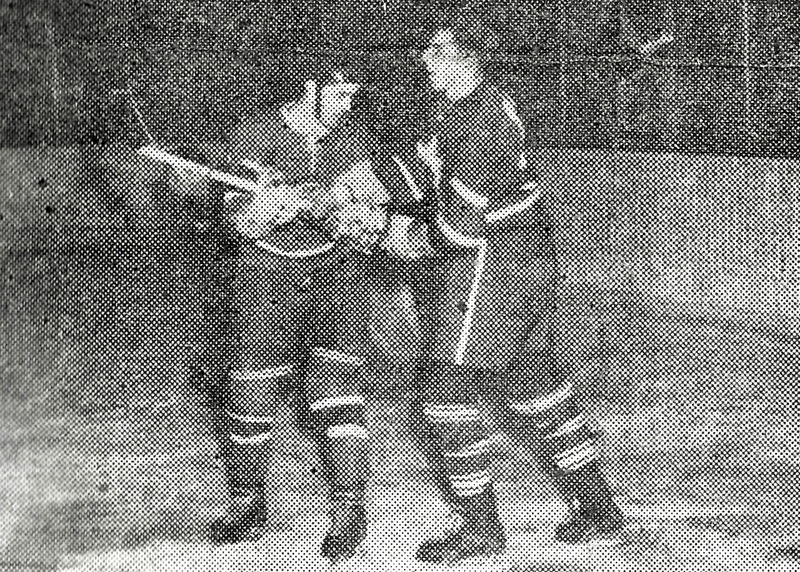 The linesmen struggling to break it up are (left) George Hayes and Mush March. The latter has a grip on Canadiens’ Butch Bouchard, who’d later stand accused of punching Hayes. 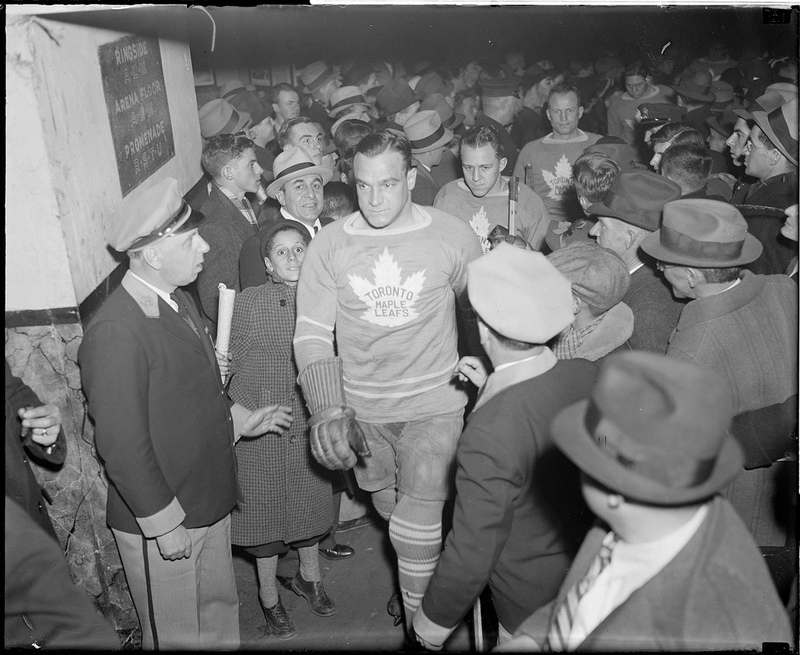 Hayes, for his sins, has a grip on (white sweater) Chicago’s Ralph Nattress and (beneath him) Montreal’s Jimmy Peters, both of whom would be assessed majors. The Chicago Black Hawks lost the first five games they played to open the 1947-48 NHL season. 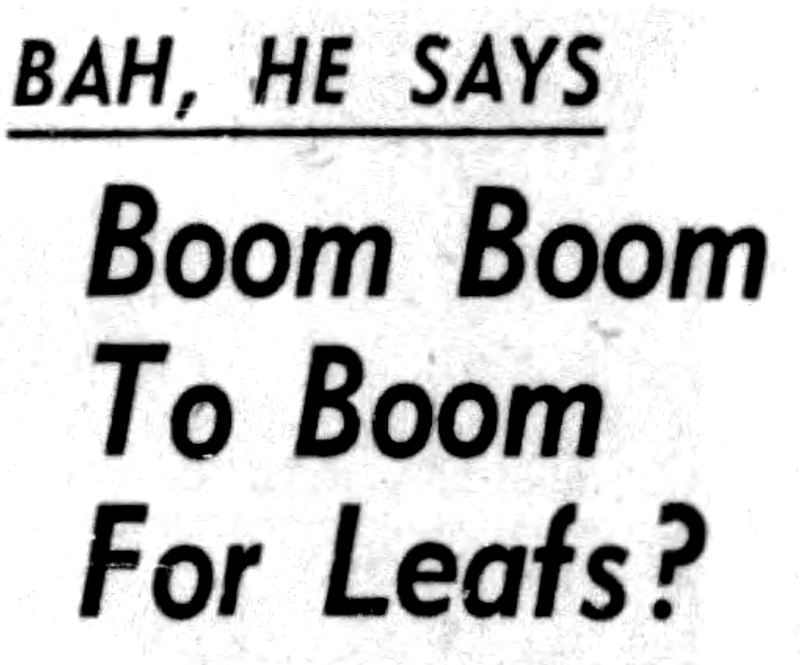 When, in early November, they lost a sixth, 4-2 at home to Montreal, Hawks’ president Bill Tobin decided it was time for a change. 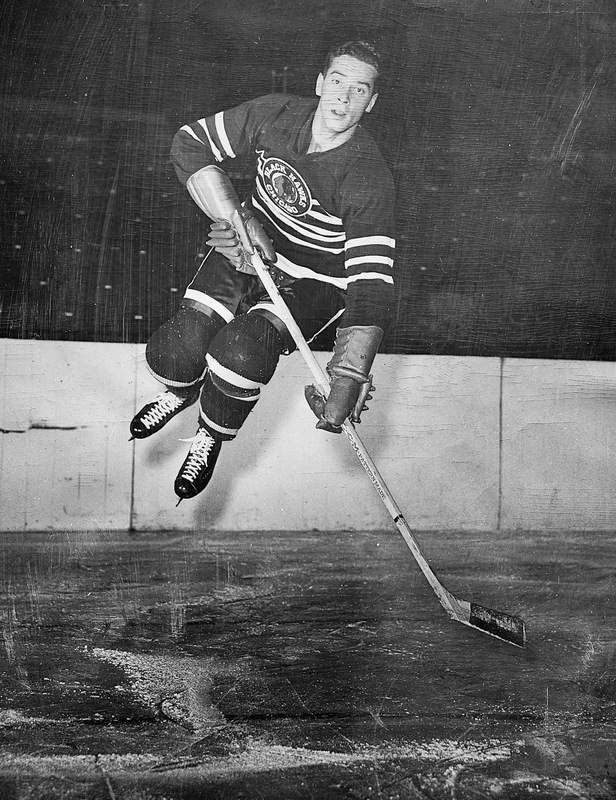 The one he had in mind turned out to be the biggest trade in NHL history, with the Black Hawks’ Max Bentley, the league’s incumbent leading scorer, heading to Toronto with Cy Thomas in exchange for Gus Bodnar, Gaye Stewart, Bud Poile, Bob Goldham, and Ernie Dickens. For the Black Hawks, it didn’t change much: they lost their next game, against Boston, and finished the season in the NHL’s basement. Hayes was working the game as a linesman, along with Mush March; the game’s (sole) referee was George Gravel. Still, for Bouchard to be attacking any of the game’s officials would seem to spell trouble for the big Montreal defenceman. None of the newspapers reporting on the incident had much in the way of detail to offer, including Montreal’s Gazette, which reported that NHL President Clarence Campbell was waiting to get Gravel’s report on the game. The Gazette’s synopsis, in the interim: the game was “hard-fought;” Hayes hailed from Ingersoll, Ontario; Bouchard, weighing in at 200 pounds, was banished “after landing blows” on the linesman.